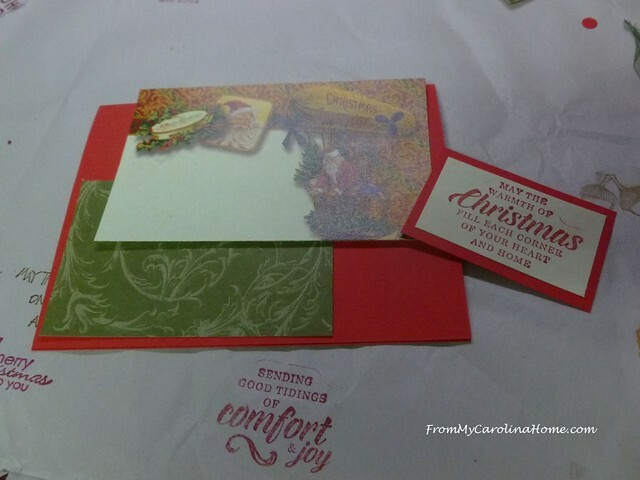 Making Christmas cards is one of the most fun stamping times of the year. There are so many little things in my stash I’ve yet to use from cute stickers and cut outs, to fun papers and stamps. I scored a few more items at the thrift shops recently too. One of the things I got as a gift was a packet with scrapbooking pages. These are all Christmas theme with large white space in the center for photos, and fun extras like stickers to finish off the pages. 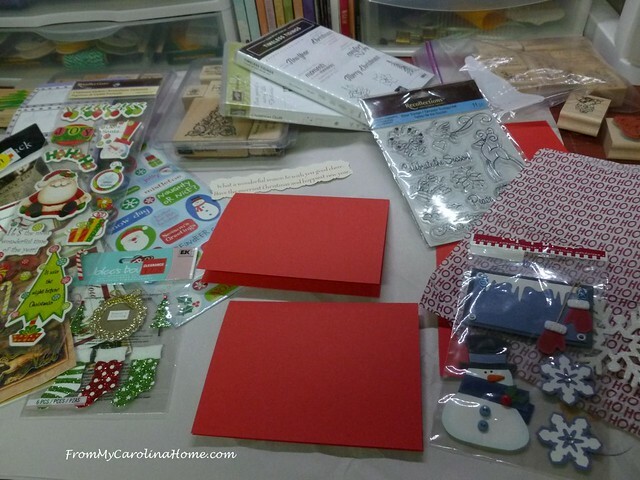 But I don’t do scrapbooks, so I wanted to use these supplies to make cards. I began by cutting card size sections from the 12×12 paper taking advantage of the edge detail. I really love the old world look of the motifs. 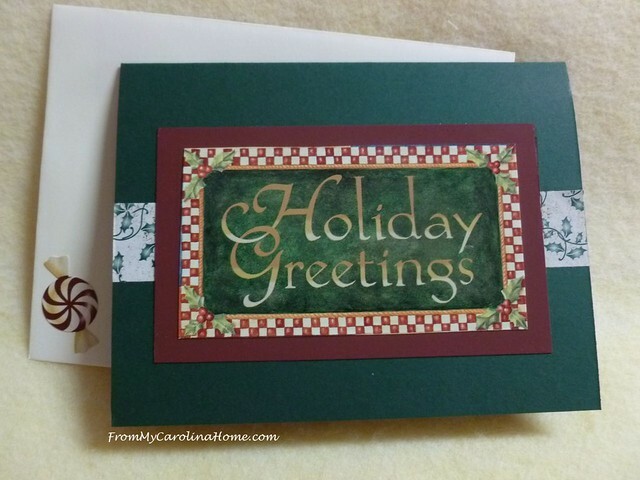 I added three lines of red decorative tape across the middle, and stamped a greeting in the white section. It was mounted on a red card. The final touch was adding one of the coordinating stick on dimensional Santas. 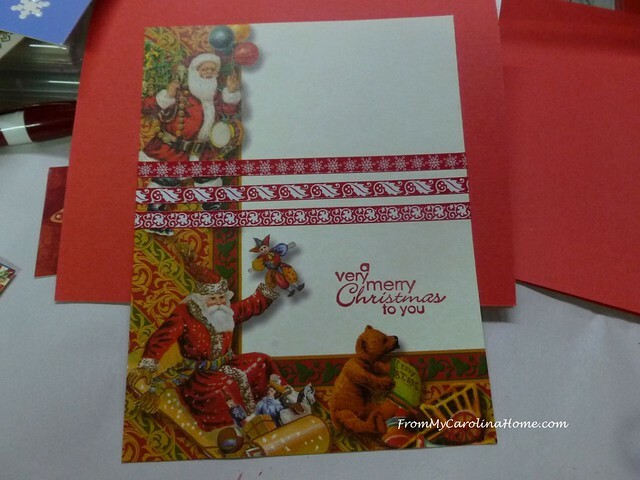 Then I cut the upper right section of the Santa decorated edge paper to incorporate into the next card. The sentiment is stamped in red and framed with red card stock. I found some green printed paper to coordinate. Assembling the elements on a red card, I liked the Santa looking down from the balloon, so I gave him a train to look at, pulled from the coordinating stickers. Placing it last, it overlaps the sentiment a bit to add dimension. On the next card, the upper left edge of the paper was trimmed to the right size for the card, and a sentiment framed in red is placed on the lower right. In the middle, a green leaf is the base for a dimensional poinsettia element. Using an element from another card, I made this one very simple. The Holiday Greetings is mounted on red suede card stock, then placed over a ribbon of ivy paper. The envelope got a candy sticker. 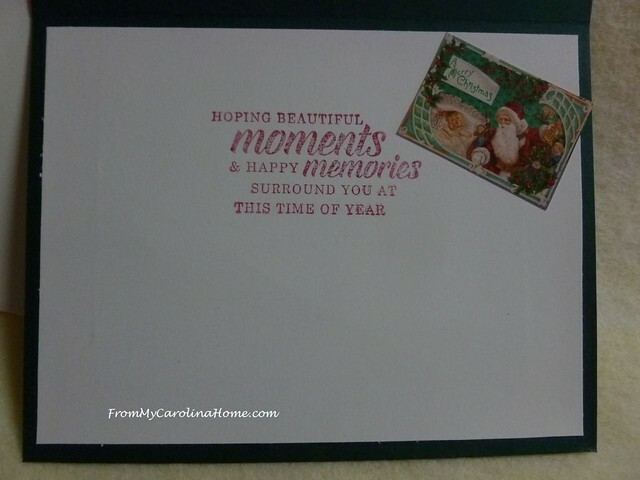 Inside, a stamped greeting with one last element from the Christmas edged paper. I mailed off two of them before I could get a pic of all of them together. I’ll be making a lot more this week, as I am already receiving cards. 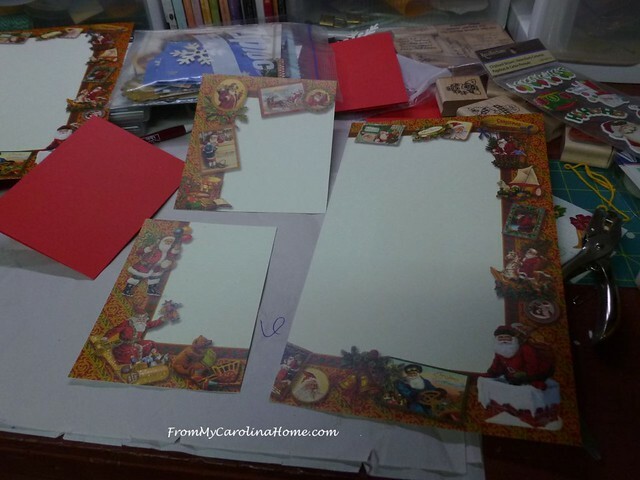 Save the cards you get this year, and see this post for ways to repurpose them – Crafting Projects From Christmas Cards. 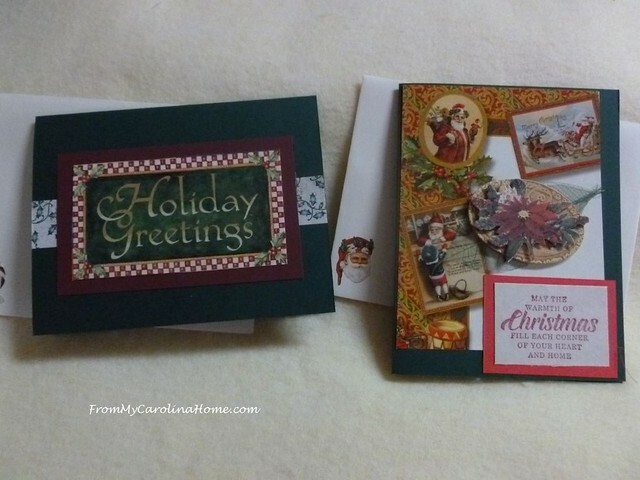 For more ideas on making holiday cards, here are some of my previous posts. First up, making Iris Folded Christmas Cards. The iris refers to the iris of a camera lens. 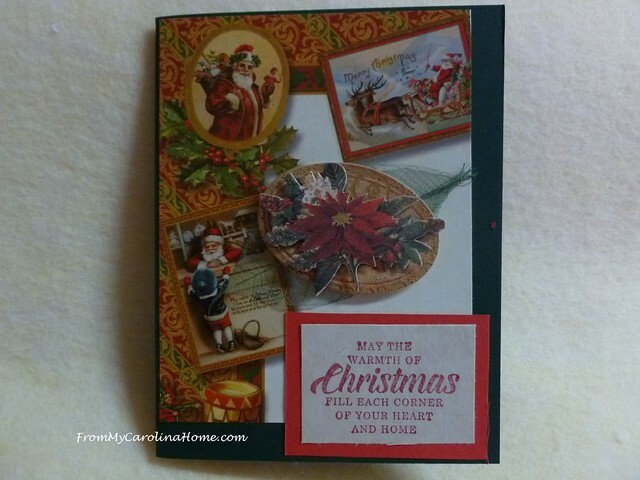 Stamping cards with my dear mother in law is posted in Christmas Cards 2015. Are you a stamper? 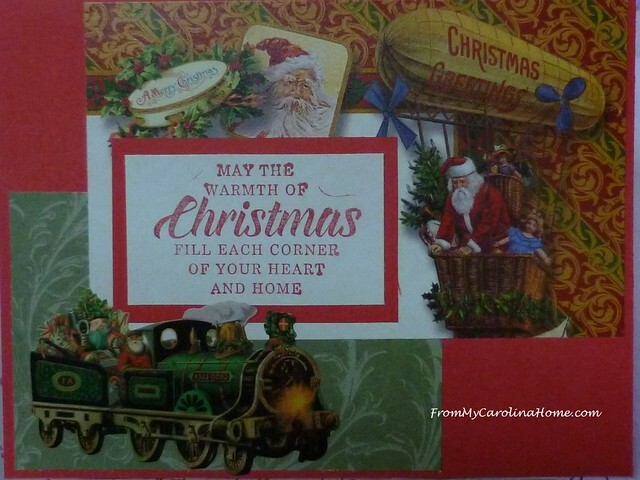 Do you like to send holiday cards? Kuddos to you and all that continue the tradition of sending Christmas cards!! I love these Carole! Merry Christmas! Beautiful cards and best use of upcycling decorative papers! Thank you for sharing inspirational ideas. Lovely cards Carole, and I followed your link to when you and DML had fun together doing it. 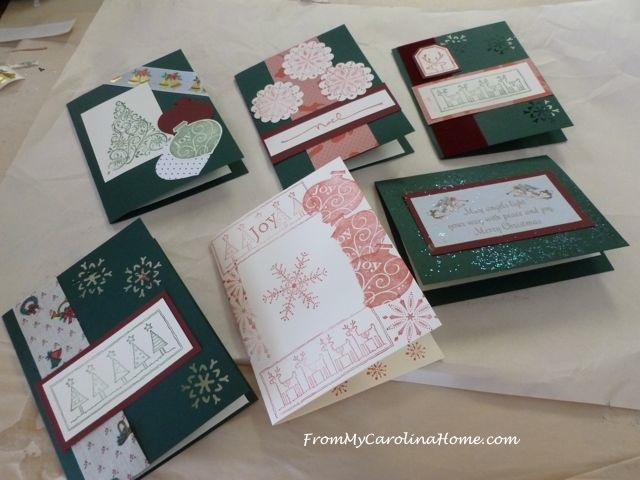 Those dark green cards were my favorite, so elegant, especially with the white showing through the snowflake stamp. We have a couple of granddaughters who enjoy stamping, and I always look forward to receiving one of their cards at Christmas. How is your weather today, and did you get much more accumulation? DH told me that on our news yesterday evening, they mentioned how bad your weather was and how many accidents were the result of icy roads. Stay safe indoors. 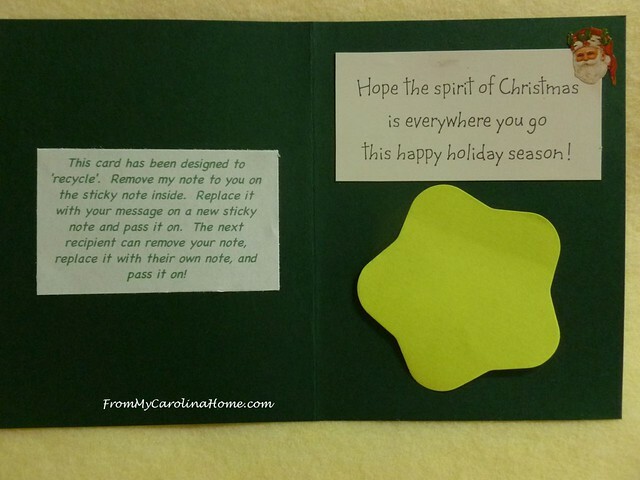 What a great idea, to make a “reuseable” Christmas card using sticky notes for the personal part! The cards you made are beautiful. I’ve had your “Happy Harvest Blessings” card that you sent with the layer cake I won, on an easel in our home. So pretty. thank you for the great ideas. Often, I have thought that decorative sheets would be nice to use but felt the paper too flimsy on its own. Wasn’t creative enough to consider putting this on card stock for a card. My grandson and I enjoy making cards. We enjoy looking for craft materials in thrift stores; he is much more imaginative than I, so he is great at finding new-to-us treasures. Your cards are definitely works of art! Just love your creativity. Now to figure out how you made that iris tree!!! I still send out cards…the boring, store-bought kind though, not beauties like yours! Hello Carole, These are all fabulous cards you have created and shared with us! Your Santa in the Balloon looking down at the train is my favorite. The recycled card idea is an excellent idea! Thank you for sharing your beautiful cards with us. I always look forward to seeing what you use to create your cards. Have a fabulous day! Oh, I just remembered that I wanted to ask you if you received any snow and if so how much? These Christmassy embellishment stickers are soooo lovely! Really pretty cards, I like how you arranged each one. I am finishing up addressing my Christmas cards today. I needed 10 for the assisted living center that my craft group meets at, so I am going to have just enough handmade cards to send. If I get any unexpected cards, I will need to make more. You always make the best cards. These are all so lovely and capture the spirit of Christmas. We still enjoy sending Christmas cards to old friends we don’t get to see very often and family that is far away. It is good to keep in touch and hear about their kids and doings. But making 40 handmade cards is a bit out of reach, so we use boxed cards. You have inspired me to make a few though, so that is on the plan for this week. I;m presently making several hexi table toppers for gifts to very special family members! What great inspiration I find here! Thank you sincerely! Those are gorgeous, Carole! I did make my own cards a number of years back, with my daughters. It was a great holiday craft to do together! I stopped sending out cards a number of years back, when life just got way too busy….and I never looked back. All gorgeous Carole. That’s smart to use the scrapbook paper with the white area. I love your “use it all” mentality, Carole, and your cards as always are just beautiful. You really are gifted in this area. Enjoy making! This looks like so much fun, and what special cards you have created, they are a present in themselves! 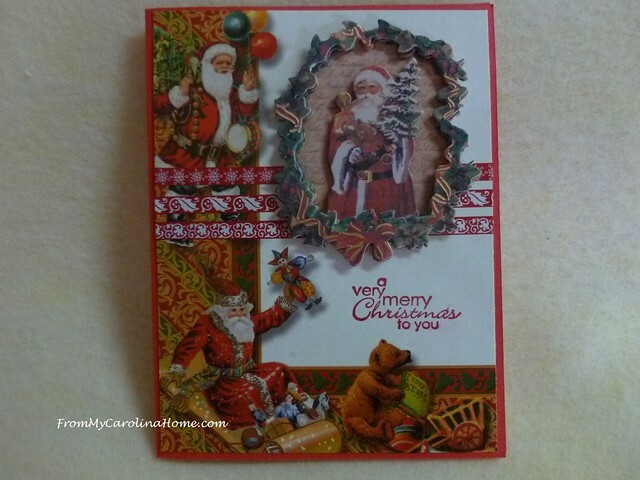 I adore the vintage look of your embellishments Carole. Way to use up your stash! Great way to use the scrapbook paper. 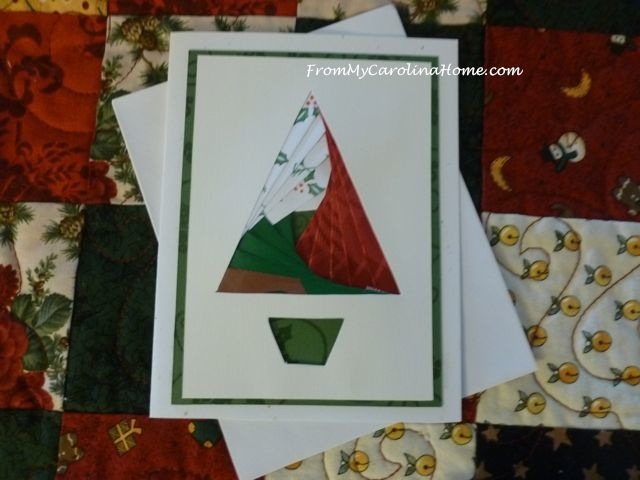 These cards are beautiful, Carole!